Drivers in Caithness could be gearing up for changes in the way they travel, with the launch of a new scheme to encourage road users to share car journeys. JourneyShare Caithness helps you find others going your way before you set off, aiming to put an end to the problem of people driving 20 miles to the shops only to find their next-door neighbours in the same checkout queue. It can also be used to share journeys to work and could be of particular use to people commuting between Wick and Thurso, visiting Inverness or travelling to and from hospital appointments. 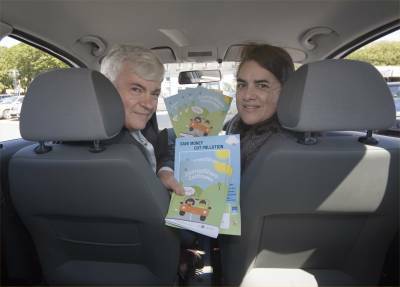 A poster campaign is helping point drivers in the right direction, by giving advice on how to organise a car-share via the newly-launched JourneyShare website or by calling a dedicated helpline. John Green, Chairman of Caithness Transport Forum, says that sharing journeys makes sound financial sense and helps protect the environment: “Car sharing on your daily commute could cut your fuel bills by as much as £1000 a year, although even sharing the odd trip to the shops can save you money. The free scheme, run by HITRANS, who are sponsoring the site; the Caithness Partnership Transport Forum; and Liftshare.com, a company specialising in organising journey sharing throughout the UK, can be accessed by internet or phone. Users either register on www.JourneyShareCaithness.co.uk or they can contact the call centre on 08700 111199 and provide details of the journeys they would like to make. The system then matches these details with people who have already registered. The JourneyShare scheme also helps users find walking and cycle companions and can provide information on travel and public transport.